Teams are starting to settle in as we’ve reached Week 4 of the 2017 Utah high school football season. We’re starting to get a sense of which teams and players are for real and which have work to do. Nata Suguturaga (Mountain View) completed 18-of-26 tosses for 417 yards and four scores, and ran for 138 yards and two TDs on 13 rushes as the Bruins (1-3) picked up their first win against Union (2-2) 54-43. 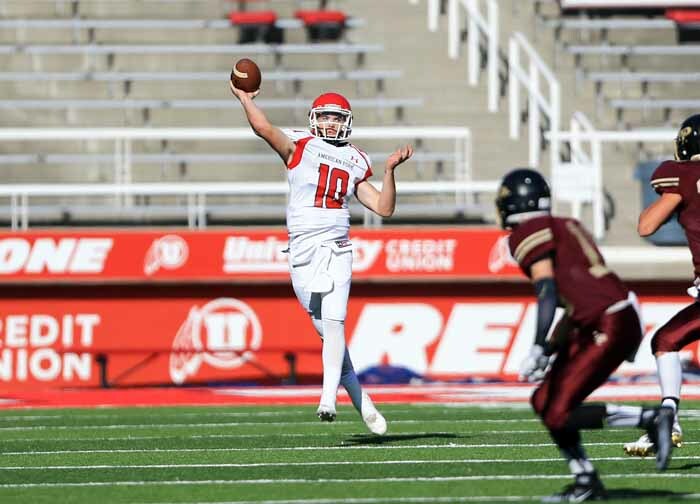 Bronson Barron (American Fork) completed 16-of-36 passes for 320 yards and five touchdowns as the Cavemen (2-2) knocked off Herriman (0-4) 35-14. Zach Wilson (Corner Canyon) completed 11-of-17 passes for 204 yards and two TDs and also ran 18 times for 182 yards as the Chargers (4-0) took care of Orem (2-2) 27-14. Crew Wakley (Jordan) connected on 10-for-19 for 183 yards and ran for 173 yards and three touchdowns to pace the Beetdiggers (3-1) in their 49-33 win over Taylorsville (2-2). Gabe Sweeten (Timpanogos) completed 19-of-29 passes for 281 yards and three scores, and also ran for 100 yards and two more as the Timberwolves (4-0) defeated West (2-2) 33-21. Nick Freeman (Ogden) passed for 243 yards and three TDs, and ran for an additional 110 to lead Ogden (1-3) to a 28-19 win over Carbon (0-4). Jake Jensen (Pleasant Grove) completed 24-of-32 for 369 yards and two TDs as the Vikings (0-4) lost to Riverton (1-3) 23-17. Jeno Bins (Tooele) carried 35 times for 229 yards and a touchdown as Tooele (2-2) knocked off Grantsville (1-3) 30-24. Ma’a Notoa (Skyridge) ran it 18 times for 182 yards and three TDs as Skyridge (4-0) stayed perfect with a 21-17 win over previously unbeaten Viewmont (3-1). Mateen Lomax (Spanish Fork) had 11 carries for 150 yards and a TD to lead the Dons (1-0 Region 10, 3-1 overall) to a 42-7 victory over Uintah (0-1, 1-3). Sese Felila (Kearns) picked up 272 yards and two touchdowns on 36 carries as the Cougars (4-0) beat Olympus (2-2) 35-21. Skylar Averett (Ridgeline) needed just nine runs to pick up 163 yards and two scores as Ridgeline (2-2) beat Copper Hills (1-3) 44-13. Porter Miller (Parowan) ran for 174 yards and three scores as Parowan (3-1) defeated Layton Christian (1-3) 48-0. Nate Olson (Carbon) ran for 240 yards and two TDs on 36 carries in the Carbon loss to Ogden. Cade Hadley (Fremont) caught eight passes for 160 yards and three scores as the Silver Wolves (1-0 Region 1, 3-1 overall) beat Layton (0-2, 0-4) 38-12. Brooks Mickelsen (North Sevier) hauled in 10 balls for 170 yards and five TDs as North Sevier (3-1) topped American Leadership Academy (1-3) 39-13. Danson Omar (West Jordan) had four receptions for 164 yards and two touchdowns as the Jaguars (3-1) knocked off Hunter (1-3) 28-8. In a losing effort for Orem (2-2), Puka Nacua came up with a number of big plays once again, pulling in 10 passes for 151 yards and a score. Brayden Peterson (Box Elder) had a pair of pick-6s as the Bees (2-2) beat Pocatello 48-21. Mikey Petty (Corner Canyon) had two sacks and a huge interception in the Chargers win at Orem. Conner Ebeling (Corner Canyon) recorded 11 tackles and a 94-yard pick-6 for the Chargers. Viliami Tausinga (East) had 14 tackles, while Apu Ika added a dozen stops and a sack as the Leopards (3-1) pounded Westlake (0-4) 57-13. MJ Tafisi (16 tackles) and Mitch Medina (13 tackles) powered the Alta (2-2) defense in a tough road loss in Nevada, as the Hawks dropped a 28-7 decision to Liberty. Noah Taylor (Judge Memorial) had three interceptions in the Bulldogs (2-2) 20-12 victory over North Sanpete (0-4). Gage Mason (North Sevier) had three sacks to pace the defense in that win over ALA.
Bridger Ferguson (Riverton) had 10 tackles and five sacks as the Silverwolves (1-3) knocked off Pleasant Grove (0-4) 23-17. Dane Leituala (Taylorsville) passed for 152 yards and three TDS, and ran for 205 and a score, and also added eight tackles as a two-way star for Taylorsville in its loss to Jordan. Tyson Chisholm (South Sevier) ran for 167 yards and two touchdowns, and contributed 15 tackles and a sack on defense to help South Sevier (2-2) get the win over North Summit (1-3) 21-7.